The Amish Made Urban Cottage Chicken Coop DIY KIt 3' x 4" offers the kit you need to house chickens for your own supply of home grown eggs. This chicken coup is right at home in the city or the country. 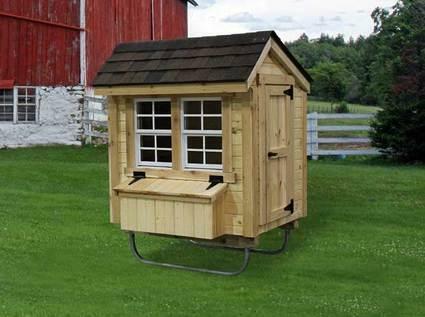 Collect your own organic eggs right in your back yard with our Amish handcrafted chicken coops. This urban chicken house is perfect for 3 to 6 chickens. It comes in kit form so you are basically building your own chicken coop. This DIY Chicken Coop comes with an inside roost and 1' x 1' egg collection boxes. The glass windows open for ventilation but there is wire mesh covering them for protection against predators. This does not come with any insulation. Please call with questions on this DIY Chicken Coop. We also offer our large 5' x 8' Urban Chicken Coop. Shown with optional EZ-skid runners, Unfinished Pine Barn Siding and 30 year dimensional shingles.